Save up to 50% off regular price booking online! 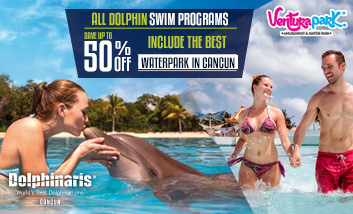 With Dolphinaris you choose how much you want to pay, choose your dolphin swim program, location and time, save up to 50% off on advance bookings. 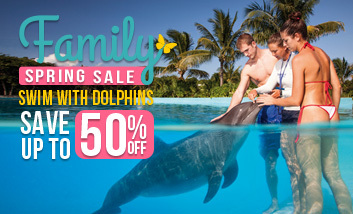 Only Dolphinaris can offer this incredible discounts, do not lose time and get a dolphins experience that you always wanted. We offer flexible schedules, dates and locations according to your needs, whether you travel with friends, family, children or partner. We have a program completely created for you. Do not wait any longer and have the best experience of swimming with dolphins that no one else can offer. Dolphinaris offer the proper dolphin swim that suits for your perfect vacation plan. To get this incredible discount, What you have to do? Choose the date you want to swim. Choose the location that fits you. Choose your dolphin swim program. Choose how many adults and children want to do this amazing experience. You will have incredible discounts that nobody can offer you. In Dolphinaris you have the best option, book your Dolphin Swim Program now! Exclusive promotion to online booking. Applicable selected locations and programs. Three-year and older visitors with a minimum height of 1.22 m / 4 ft, are welcomed. Promotion valid until April 15th, 2019.